Telescopes on Earth have detected an Earth-sized planet circling a star some 30 light-years away. Now the race is on to get pictures of that distant world, photographs and spectra that show whether or not the planet is truly like Earth - and if it bears life. Farside observatory will have the largest optical telescope in the solar system as well as a vast array of radio antennas, the most sensitive radio telescope possible, insulated from the interference of Earth’s radio chatter by a thousand kilometers of the moon’s solid body. Building Farside is a complex, often dangerous task. On the airless surface of the moon, under constant bombardment by hard radiation and in-falling micrometeoroids, builders must work in cumbersome spacesuits and use robotic machines as much as possible. Breakdowns - mechanical and emotional - are commonplace. Accidents happen, some of them fatal. But what they ultimately find will stun everyone, and the human race will never be the same. Kinda. This was not the best book in the series, and the main plot elements have been seen before. Stefan Rudnicki is a very excellent narrator and certainly brings many of the characters to life in a way that would not happen otherwise. Do you think Farside needs a follow-up book? Why or why not? This novel felt like it had a lot of padding, and could easily have been half as long. That said, the setting of the story, Farside Observatory, is excellent and intriguing, and the book could've been better if it dealt more with this, rather than the usual politics and nano machines plots we see so often from the Grand Tour novels. I was a bit surprised when I read this book. It was my first Ben Bova story and I was expecting something a little better. Right from the start, I found that the story wasn't very descriptive. The dialog was weak in my opinion and I had hope the author would ad more to the scenes. If I am missing something, then feel free to recommend another book of his. I liked that Farside was based on real science. There is an amount of suspense, but I missed the "chewing my nails" moments when you can hardly wait what's going to happen next. At certain point the killer was predictable. I liked the author's voice and the way he wrote the story. However the excerpts from the personal files irritated me. The characters' background should have been incorporated into the story. Farside is an OK read. Ok. Ok story, ok characters, ok writing. This was ok. Kept my ears busy, put pretty pictures of moon bases and telescopes and stuff in my mind's eye. Characters were human. Not much thought went into the idea of living on the moon though, there were all kinds of opportunities for awesome details about the hardships and difficulties of a permanent moon colony, that were conveniently ignored. Having read Red Mars (Kim Stanley Robbinson) this was frustratingly shallow. But it entertained me, and I'll probably read more of Mr Bova's works. What Were You Smoking, Ben? I love Ben Bova, but don't know where he was when this novel was written. Definately not even close to his usual standard, which I think is among the best in Science Fiction. Stefan Rudnicki was what kept me going. His performance was stellar, as usual. The story does not have the "sense of presence" for which Bova is well known. I wasn't "right there" like I usually am. Read the book a month ago, and couldn't tell you the main character's name today, or for that matter, what the book was about. What did you like best about Farside? What did you like least? The concept was good, the science behind the telescopes - the drama was weak. What could Ben Bova have done to make this a more enjoyable book for you? It is hard to believe that this novel was written in the present era. At one point, the lead character, in a space suit out on the Moon's surface, asks one of his assistants to go inside and get him a camera. Right. Like in a century from now (or whenever the near-ish future date is) that there's not going to be a camera in his suit - or retina, or...There are several similar instances which reveal a poorly conceived future setting (a pad of paper, conveniently found in a desk drawer, on a limited-supply Moon outpost? Riiiight. Even today, the average N American only picks up a pen every few weeks) etc etc. Then there is the dialogue. It's not just cliché-ridden and cringeworthy, it's also frighteningly dated with regard to the sayings people use and rife with cultural references that are already decades past. MAYBE the author intended to use phrases so old that many of today's 20-somethings wouldn't even know what they meant - just so the book would come off as authentic classic sci-fi from another era. Sort of like what SM Stirling did with his Mars & Venus 'Sky People' alternative reality books a few years back. I sure hope so. The alternative - that Bova meant this to be a modern, credible science fiction novel - is scary to contemplate. Great plot, Excellent Narration, Must Read! Leave it to Ben Bova to create a race out of astronomy accolades. Farside takes us to the dark-side of the moon where a deep space telescope is being constructed to look at a planet called New Earth. This effort, of course is in competition with an rival Earth based effort. Two scientists, racing to be the first, racing the Nobel prize. What mischief is hatched? Hmmm. Well that’s for the plot to lay out and for you to listen to conclusion to. I absolutely admire and love Stephan Rudnicki’s narration; he is an old hand at it. He has narrated numerous Sci-Fi, namely Orson Scott Card for one. My favorite is Card’s Hidden Empire series. Rudnicki gives the characters weight as Bova weaves their depth. As a sci-fi genre goes, you don’t have to take a great many leaps of faith to believe the story. And the magic ‘unobtainium’ card, that most writers use, is kept at bay. I think this story will appeal to both the general Sci-Fi listener and well and the purist. OMG! 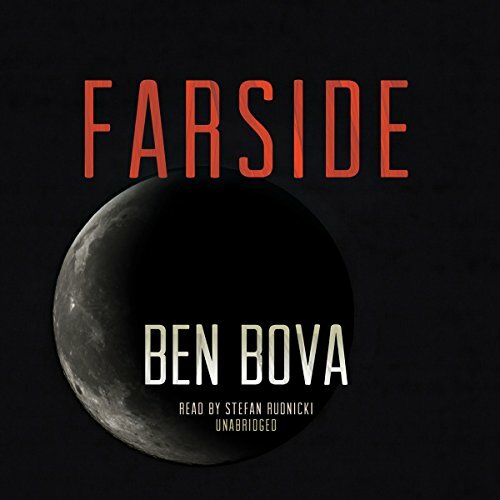 I just listened to two hours of Farside by Ben Bova. I'm going to quit it and try to return it to Audible. I don't cry "sexist" at most books, but this is the most sexist piece of drivel I've ever read. It seems like it was written in 1953 rather than 2013. Add to the fact that 1/2 of the book so far has a female POV character and it's narrated by Stefan Rudnicki. He's a good narrator, but a very poor choice for this book. He has a very deep voice and can't do women well at all. UGH! What did you love best about Farside? Has Farside turned you off from other books in this genre? This is NOT Ben Bova's typical writing I have a feeling he wrote it when he was 15 and just published it without rereading it . The story is good but the huge plot holes and just poor writing spoil the book. there are things that just do not make sense he puts things out that don't make sense and later in the book makes some poor expiation about them. like he was too lazy to go back and fix the original writing. An example of a plot hole. There was a "nano" hole in an air lock that depressurized a compartment that was at least a hundred meters wide come on !! Even normal leakage would be more then that . a nano hole would not even be noticed. If this was the only example I could could ignore it, but sadly its not. Caught up in character affairs instead of science. I prefer hard SF and speculative fiction. This book provides an enjoyable amount of technical detail but I felt that the main discovery seems to have been delivered flatly and in a rush with too much attention paid to character driven action and affairs.